-16- April 1978 We would like to announce to you the publication of [[underline]]El Nahuatzen[[end underline]], and we are asking you to please publish our announcement to your friends, fellow writers, and contacts. Sincerely, [[handwriting]] Lowell Jaeger [[end handwriting]] Lowell Jaeger, Editor [[underline]]El Nahuatzen[[end underline]] [[underline]]El Nahuatzen[[end underline]], a poetry magazine with emphasis on poetry by Chicano and Native Americans, is now soliciting quality manuscripts from [[underline]]any[[end underline]] interested poet. Each issue of [[underline]]El Nahuatzen[[end underline]] will feature an unpublished Chicano or Native America poet and will also publish a poem or an open letter from a prison inmate. Beyond that, our only other bias is for literary "quality". Submissions deadline for issue #1 (September '78) is July 15. 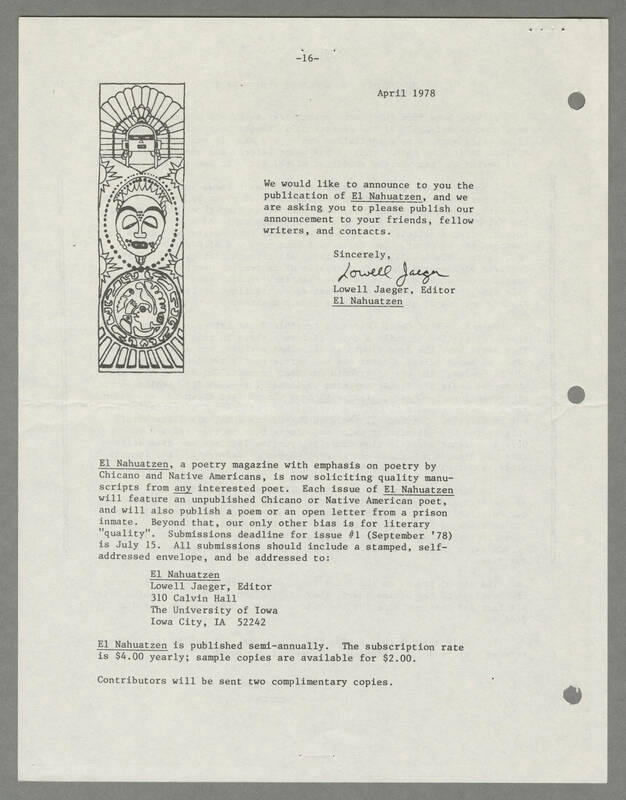 All submissions should include a stamped, self-addressed envelope, and be addressed to: [[underline]]El Nahuatzen[[end underline]] Lowell Jaeger, Editor 310 Calvin Hall The University of Iowa Iowa City, IA 52242 [[underline]]El Nahuatzen[[end underline]] is pubilshed semi-annually. The subscription rate is $4.00 yearly; sample copies are available for $2.00. Contributors will be sent two complimentary copies.